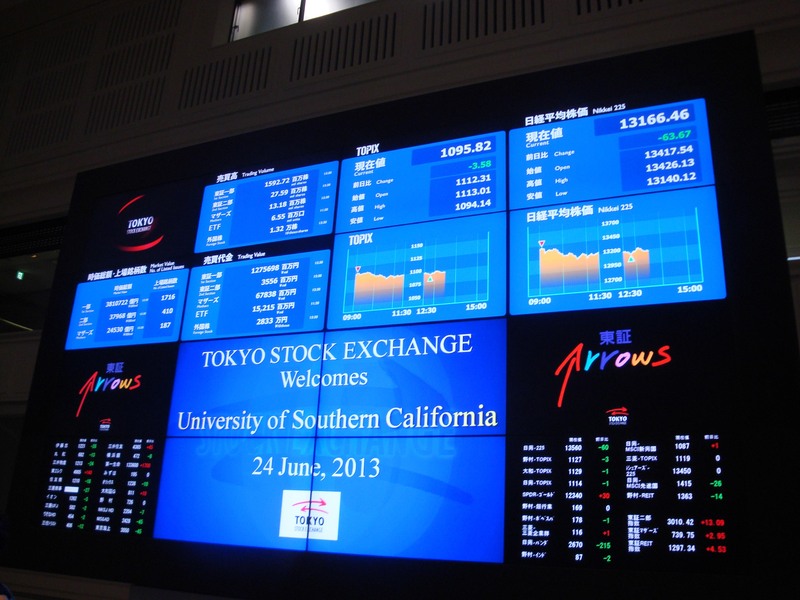 An eventful and tiring day – we had two tours after class covering the Tokyo Stock Exchange and the Bank of Japan. The stock exchange was very welcoming and took a few minutes to replace some of the screens, usually filled with stock prices and statistics, with a welcome message just for us! Later, we were lucky enough to witness a ceremony initiating a new company to the stock exchange! Only 66 companies were added to the TSE last year, so we were lucky to witness such a rare event. Another interesting thing we noticed in the stock exchange was that the numbers on the ticker were opposite in color from those on the NYSE. Red being a lucky color in Japan is assigned to the positive numbers, while the negative numbers are, counterintuitively for us, green. Our tour guide said she thought of the red numbers as the market “heating up” – but offered no explanation for the use of green. I think it’s just to confuse Westerners. Today’s visit to the Bank of Japan was like a journey into the center of the Japanese economic kokoro. For all that Japan seems modernized and westernized on almost every level, it was definitely interesting to see how Japanese ideas and values permeate the deepest reaches of its operation. For example: The first layer of Japanese face was how Japan’s national bank projects itself in its building – a formidable work of neo-baroque architecture, designed by the so-dubbed father of western architecture in Japan. Westernization permeates the bank almost completely – from the furniture on display to the first door of the historic main vault. Weighing in at around 15 tons, the door to the vault was actually made in America and shipped over here (how do you ship something that heavy? I can’t even imagine the size of that boat). But since the vault has recently been phased out of use in favor of a new one nearby, we were able to enter and see the inner doors. The second door was a little thinner and of British construction, and then the last door to the main vault chamber was finally of Japanese construction. It felt like we were entering the kokoro of Japanese society and financial system, passing through a Japanese door into a room once filled with precious Japanese money – paper and gold – regulating and protecting Japan’s economy from the core. We were also told a story about the vault’s ventilation system that struck a chord as one of the most uniquely Japanese practices I know of. 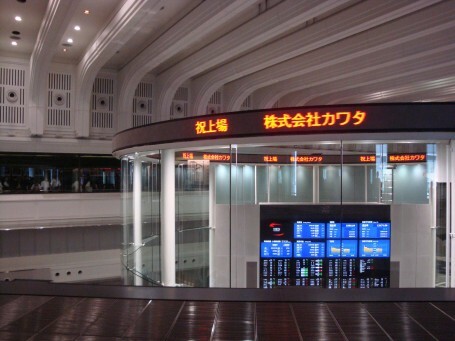 The ventilation system is connected by pipe to the nearby river, and the bank personnel can flood the vault if it is under attack. As the Japanese honor code and proud heart would dictate, the bank will destroy its own money before allowing it to fall into evil hands. 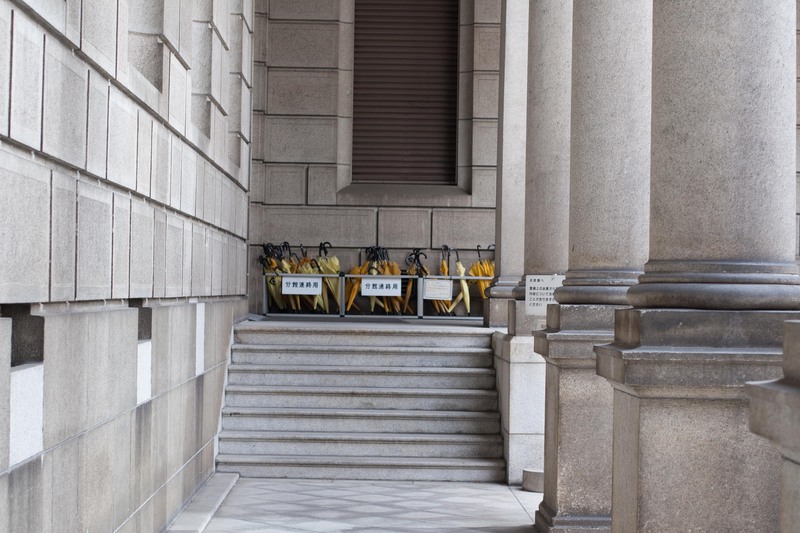 Since we couldn’t take any pictures inside the Bank of Japan, here’s a glimpse at who’s inside – evidence: umbrellas! Perhaps the best part of today’s outings was a shared aspect of the informational videos we saw at both places: the virtual guides! 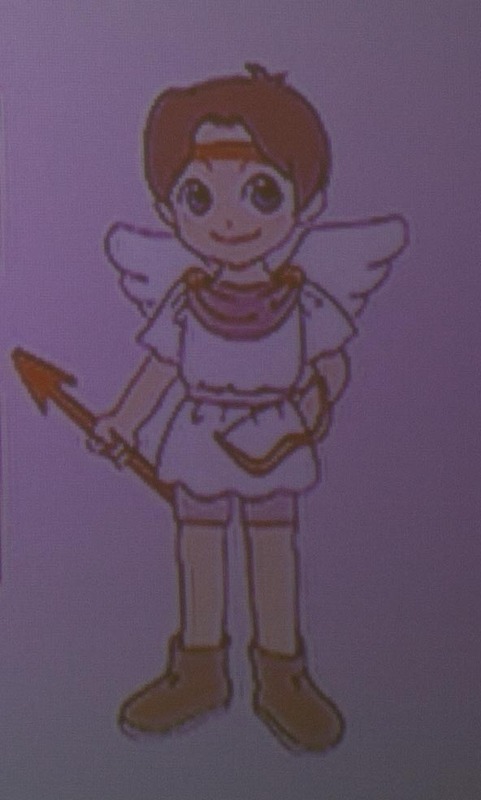 The first of the videos featured a little flying angel named Arrow who shot arrow-shaped arrows at the ceiling to trigger large displays to come up to answer the questions posed by the girl taking a tour in the movie. 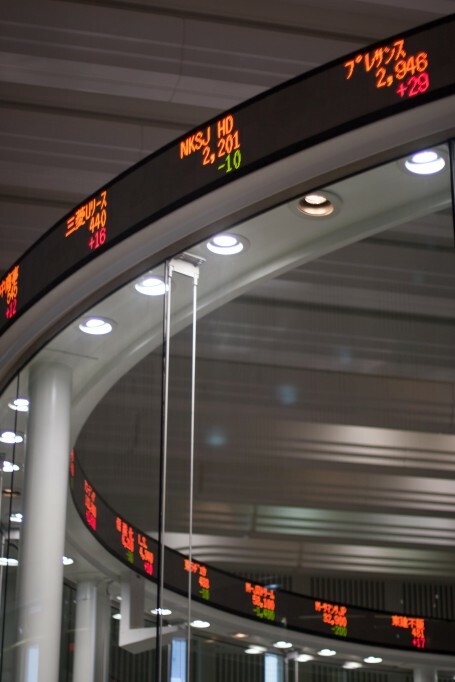 Our little virtual guide at the stock exchange. Isn’t he cute? We all thought this little angel was hilarious, but we knew nothing of hilarity until we saw the second video – the video at the Bank of Japan. Instead of an angel, the guide was just a booming male voice. The person taking the tour in the video was still a helpless young woman, which made the situation even more surprising! But more than the genders of these characters, what surprised me the most about the bank’s video was that the booming voice would say “follow me” and the girl would know which way to go. It was pretty impressive that she could follow a voice that had no perceivable origin. But seriously, should she really just follow this voice wherever it says? This entry was posted in Tokyo by geajapan. Bookmark the permalink.